Crusade Basketball has a lower SRP over the 2012/13 Set, but still includes many of the same elements that collectors will remember from last year. One complaint I have about this years Panini Crusade Basketball is that the set lacks a nice autograph rookie card to chase. There is the Apprentice Autograph set, but that has a lower end insert card set feel to it. Personally I think Panini should eliminate the base cards and make the Crusade set with all the colorful parallel cards the base set. Secondly, I’d like to see autograph versions of the Crusade set – and they would make nice autograph rookie cards. Overall, for the price you’re going to pay – 13/14 Crusade Basketball offers a mid-priced set with not a lot of frills or chance to hit a huge card. For a set like this to really sell on the secondary market, there needs to be autograph rookie cards – which Panini has missed the boat on in this set again this year. 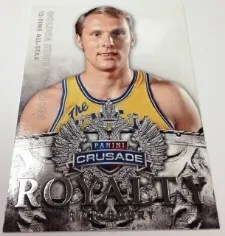 Finally, the Crusade Basketball has always had an odd feel with the sets namesake “Crusade” being a chromium type card – but the rest of the set is rather cheap & vanilla looking white-stock cards. I think Panini would be better off eliminating most of the inserts sets and make this a “Topps Chrome” like product where you’re really just chasing the refractor parallel & autograph cards. Given that there should be plenty of 13/14 NBA sets yet to be announced/released by Panini – I’d expect hobby boxes of this product to hang around, so don’t feel bad if you don’t break or buy any of the cards early on … there should be plenty of it (probably at cheaper prices or some kind of National Convention/Wrapper Redemption special).